I simply Can’t live without…. Our Salon Manager and Consultant Jodie has three products she simply can’t live without. Being a busy stylist in salon she works with all kinds of hair from fine to ultra thick. Her forte is short hair , she loves to add texture and shape and really tailor hair to the clients lifestyle and hair type. These are my top two fav products…. 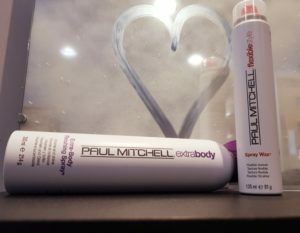 I can’t live without this product because its it adds great texture and is easy to use but still lightweight at the same time which means you can use it as a 2nd day product to rebuild your style. This might be my second favorite product but it’s a No 1 hairpsray. its medium hold leaves the hair with flexibility and movement whilst providing a lovely shine. It’s easy to brush out too which is an added bonus. It’s formula is designed so that each droplet plumps out each individual strand of hair for added volume. I simply can’t live without this styling potion, It’s just so lovely and has a fantastic hold , helps create lots of volume with a non-sticky finish…….smells good enough eat! 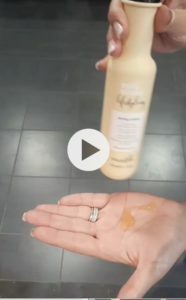 Apply a small amount into the palm of your hands then distribute through the hair from root to tip.